Contact us now to arrange it! 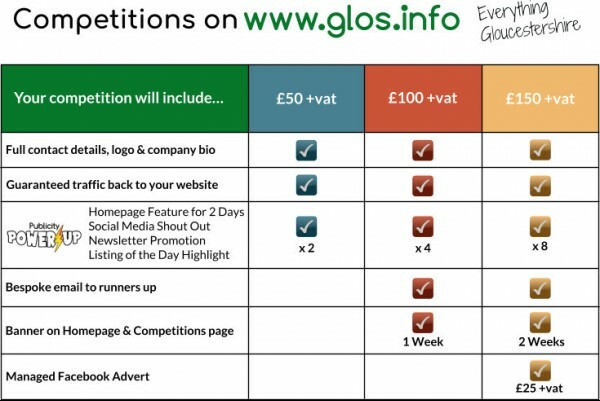 Why you should run a competition on www.glos.info? Answer: Lots of new people will visit your website in order to enter the competition. It is no secret that the competitions page is one of the most popular pages! We know that because Google analytics tells us and if you run a competition with us, you will know that too. Do you know how we know? Well, when we run a competition, we ask entrants to answer a question and to click to your website to work out the answer. This is great for your Google ranking as the more people who visit your website, the higher up the Google ranking you go, as Google thinks you have a popular website. Also, if you choose to run Level 2 or 3 competitions, we can send a bespoke message to everyone who has entered, such as a 20% off discount code/voucher, a link to sign up to your newsletter or a personal message from yourself. So, what do you get when you run a competition? Answer: Lots of exposure as outlined below. Current and recent competitions include tickets to see Take That, Michael McIntyre, Sir Ian McKellan, Cheltenham Town Football Club, as well as spa days, mediation sessions, books, meals, overnight stays and more. To see current competitions, please click here. External Website: More details about www.glos.info and Why running a competition is a very effective way to promote what you do and your events!